VATICAN CITY (CNS) — One of Rome’s best-kept secrets is the collection of 100,000 ethnological artifacts housed in a special section of the Vatican Museums. Most of the items were sent to Italy by missionaries over the course of hundreds of years and turned into a collection at the Vatican 90 years ago. They come from as far afield as the Easter Islands, South America and Congo. They include objects from Native American tribes and from Hindu, Buddhist and Islamic religious cultures. “When people think of the Vatican Museums collections, they often forget that over half of what we have is not European,” said Father Nicola Mapelli, a member of the Pontifical Institute for Foreign Missions and director of the Ethnological Missionary Museum within the Vatican Museums. The unusually large collection was begun in 1692, when such objects were first sent to the Vatican by missionaries in Oceania, China, Australia and the Americas. Then, for the Holy Year of 1925, Divine Word missionary Father Wilhelm Schmidt, an Austrian anthropologist, asked Catholic missions worldwide to send artifacts for display at the Universal Missionary Exhibition called by Pope Pius XI to document the missionary activity of the church beyond Europe. Father Schmidt was the founder of “Anthropos,” a journal that reported field research in ethnography conducted by missionaries, especially in New Guinea and Togo. “The missionaries were the links between the church in Rome and aboriginal peoples,” Father Mapelli told Catholic News Service. The 100,000 artifacts that arrived for the missionary exposition and now form the core of the Vatican’s collection, were displayed in 24 pavilions in the Vatican Gardens and seen by 1 million people. The oldest single item in the collection is a chipped stone tool believed to have been made 2 million years ago. Otherwise, most are of particularly delicate materials, from feathers to woven straw, leather and glass beads. 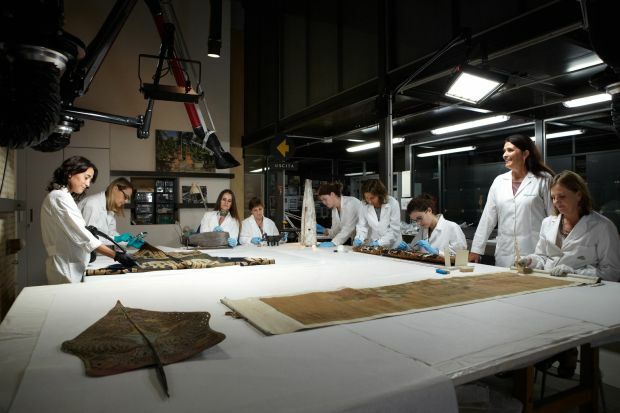 To protect this heritage, the Vatican also created the Ethnological Materials Laboratory of Conservation, recognized today as a world leader in conserving cultural artifacts that are not part of the European standard, which is based largely on classical and Renaissance antiquities. Continuing the collection’s mission as open book, the diagnostic laboratory in late November hosted its third annual international conference on “Sharing Conservation.” The gathering was dedicated to exchanging conservation experiences worldwide, and examining how the preservation of an ethnographic heritage can promote local cultural identities while also enhancing cultural exchange. “The artifacts produced by these societies require conservation, but also help boost tourism with both positive and some potentially negative consequences for those societies,” said Ricky SP Siahaan, director of the Borobudur Buddhist temple compound in Indonesia. Other participants came from the United States, Cuba, the United Arab Emirates, India, Mexico, Mongolia and the United Kingdom. The monumental Borobudur compound, built on Java in Indonesia in the ninth century, itself required conservation, because weather had taken its toll, especially upon a series of carved stone panels illustrating the life of Buddha. Fortunately, the Vatican’s plaster and cement casts in the Vatican Ethnological Museum could be used as documentary evidence of details lost on the originals.